Pulse nightclub August 2016 (click for expanded view; image Walter). In June, 2016 a gunman entered the Pulse nightclub in Orlando, Florida and murdered 49 people. In the aftermath of the murders the club has been routinely invoked in a wide range of political causes, but materially it has become a place that illuminates the depth of homophobia, complicates gun rights, and recognizes domestic terrorism. Like most dark history, the Pulse nightclub materializes death and profound tragedy, and that makes it an especially productive place to concede anxiety, apprehension, and fascination alike. Pulse may have become part of an “uncanny” materiality; that is, it is among a host of things and places that provoke uneasiness because, in Freud’s words, it “ought to have remained secret and hidden but has come to light” (PDF; compare archaeological examples from Gabriel Moshenska, Paul Graves-Brown, and Graves-Brown, Rodney Harrison, and Angela Piccini). 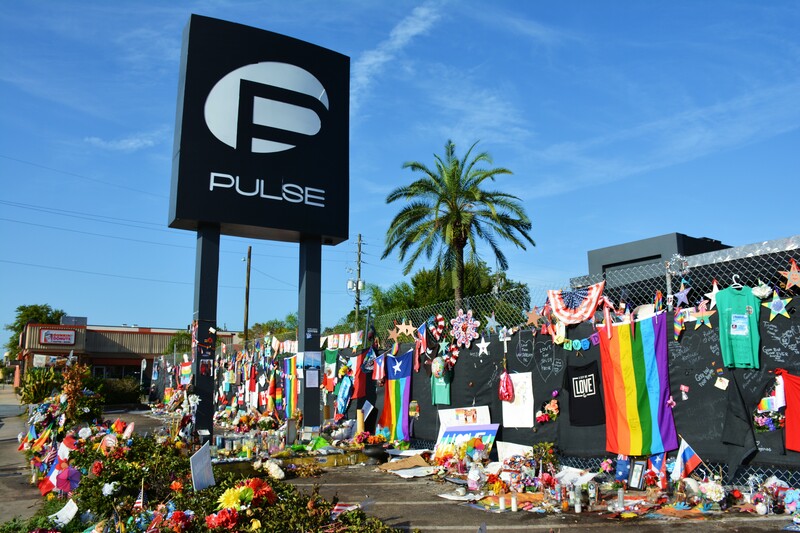 People flock to Pulse because it allows us to acknowledge anxieties about hate crimes, terrorism, homophobia, and gun violence and potentially brings them into an open public discussion, a discussion that some people welcome and others want to escape. That discussion is inevitably challenging: the club may be the proverbial historical “open wound,” confronting us with a recent past so repugnant and unpleasantly contemporaneous that we struggle to acknowledge it or simply ignore it entirely. 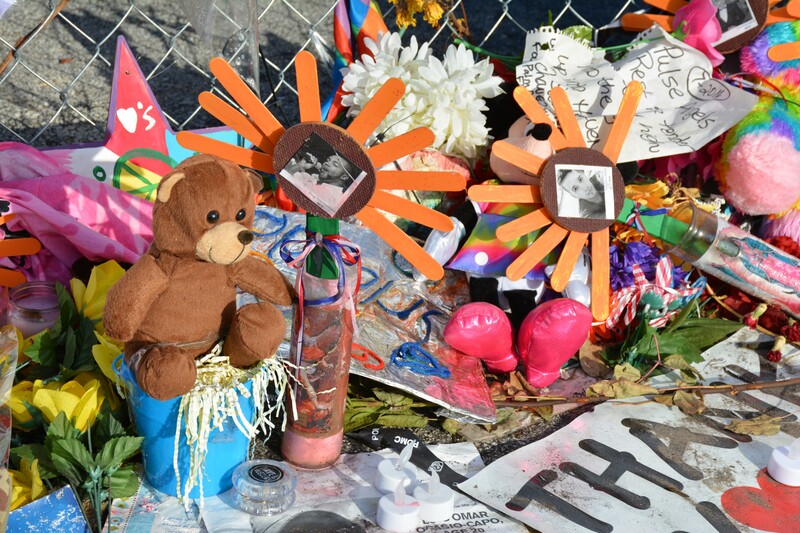 Offerings at the Pulse memorial (click for expanded view; image Walter). After the murders Pulse instantly became a scene of spontaneous memorialization, and it is unlikely to ever again be a more-or-less invisible leisure space in the midst of interchangeable retail outlets. Within a month of the killings The Orlando Sentinel’s Caitlin Dineen recognized that Pulse “has found its way onto itineraries for tourists from around the world who pay their respects and leave handmade memorials” (cf. The Advocate’s June video of the spontaneous memorial). As visitors continually flock to the club, various parties have begun to discuss a place-based commemoration, which might involve the preservation of the structure, a radical remodeling, or its complete demolition. Barbara Poma opened the club in 2004 in memory of her brother who had died of AIDS 13 years before, and in the wake of the murders she almost instantly proposed to re-open the club as a memorial. In August, 2016 Poma proposed to transform the club into a memorial, and in November she reached a preliminary agreement to sell the club to the city of Orlando. However, before the City Council could approve the $2.25 million selling price, Poma had a change of heart and decided not to sell the club site. Pulse nightclub street view (click for expanded view; image Walter). The structure itself may prove too abject to rehabilitate into any sort of memorial space, and it may meet the fate of comparable sites at which place-based memorialization is too unsettling to preserve the material traces of tragedy. In December 2012, for instance, the Sandy Hook Elementary School in Newton, Connecticut was the scene of a shooting at which 20 children and six adults were murdered, and in May 2013 Newton administrators voted to demolish the structure and build a new school in its place (the demolition debris was pulverized and discarded at a secret site to prevent it being collected). The town also acquired the murderer’s home, where he had killed his mother, and it was razed in March 2015. As a much larger tourist-friendly city, Orlando is a different community than the modest Connecticut town, and the targeting of the gay community at Pulse is somewhat different than the incomprehensible Sandy Hook shooting. Newton has not attempted to suppress memory of the Sandy Hook shooting; the community has spent several years planning a permanent memorial to the Sandy Hook tragedy, framing memorialization as the community’s acknowledgment of its shared tragedy. This is quite different than place-based dark tourism in a place like Ground Zero that aspires to promote a very broad reflective if not therapeutic discourse. 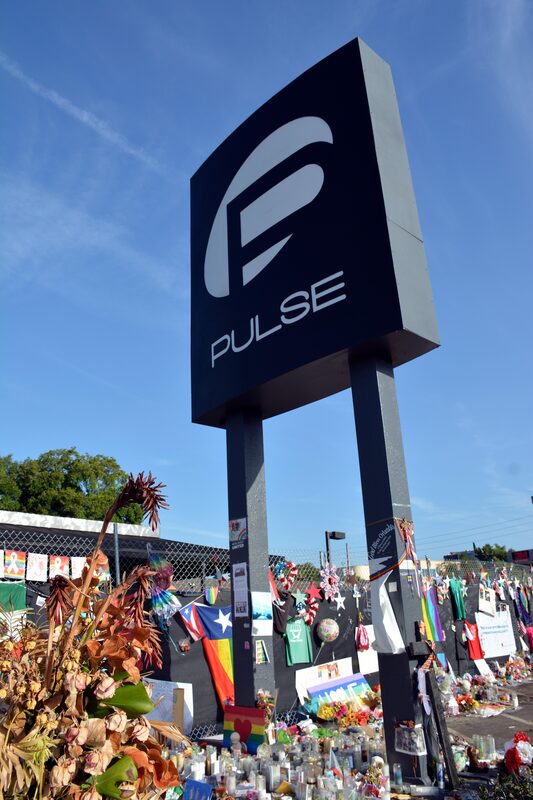 Ultimately Orlando may also find that the Pulse structure itself is such an unsettling space that it will be torn down for another material memorial. In the wake of a 1984 murder of 21 people at a California McDonalds, the company initially planned to return the restaurant to service. However, within a week of the shooting McDonalds recognized “community revulsion” and agreed to raze the restaurant. Six years later the site became home to a permanent memorial, which simply recognizes the names of the people who died during the shooting. Things left at Pulse (click for expanded view; image Walter). The Pulse nightclub structure, its otherwise commonplace surrounding neighborhood, and the things people leave at the site materialize barely expressible grief while conceding anxieties that persist in the wake of the murders. 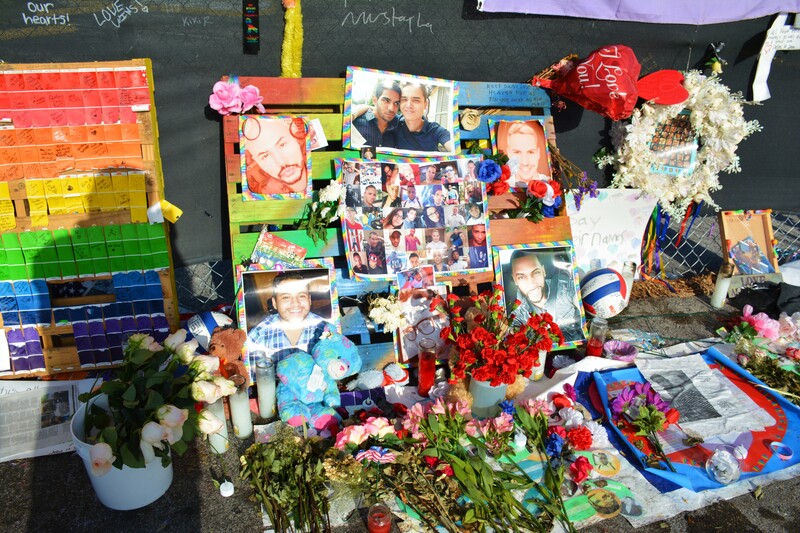 In July, 2016 the Orange County Regional History Center announced that it had begun collecting and preserving the memorials left at Pulse, and those material offerings provide a systematic politicized commentary on the many anxieties that converge in the memory of Pulse. The things people bring to Pulse struggle to comprehend the tragedy itself, but at the uncanny margins of the ignored, evaded, and suppressed Pulse and its collective materiality may be more important as expressions of broad anxieties about homophobia, domestic terrorism, and hate crimes that reach well beyond the Orlando tragedy alone. 2013 Introduction. In The Oxford Handbook of the Archaeology of the Contemporary World, eds. Graves-Brown, Paul, Rodney Harrison, and Angela Piccini, pp.1-26. Oxford: Oxford University Press. 2001 From Monuments to Traces: Artifacts of German Memory, 1870–1990. Berkeley: University of California Press. 2006 The Archaeological Uncanny. Public Archaeology 5:91-99. 2013 The Archaeological Gaze. In Reclaiming Archaeology: Beyond the Tropes of Modernity, ed. Alfredo González-Ruibal, pp.211-219. New York: Routledge. 2006 Performative Commemoratives: Spontaneous Shrines and the Public Memorialization of Death. In Spontaneous Shrines and the Public Memorialization of Death, ed. Jack Santino, 5-15. New York: Palgrave Macmillan. 2008 Consuming Dark Tourism: A Thanatological Perspective. Annals of Tourism Research 35 (2): 574-595. Posted on March 19, 2017, in Uncategorized and tagged dark tourism, Pulse. Bookmark the permalink. 1 Comment.